Predictability and insurance don’t necessarily go hand and hand; after all, if we could predict the future no one would need insurance, right? Just as Eleanor Roosevelt said, living life not knowing the future is way more flavorful! Granville Insurance promises to be your sidekick and partner to ensure you’re thoroughly covered so you can live a life with flavor. A little bit about myself: My name is Lyndsey Springer and I’m the owner of Granville Insurance. I have this strange love for succulents and orchids (my husband may say I’m a little obsessive because our house is full of them). Call me crazy plant lady if you want but it's not because I live the life of a botanist, but rather because of the way I take care of them. Yes, I may be a little OCD, but I think of myself more like Monica from "Friends," is that bad? The only difference between Monica and I is the boys I love to cook for are my kids...which yes, includes my husband. Since it doesn't make sense to travel the country in our 1967 Fan Camper stopping at every The Avett Brothers show along the way I'll stick to running Granville Insurance. After all, my true passion is taking care of the people I love. They say a photograph is worth a thousand words and I have one worth more to me. 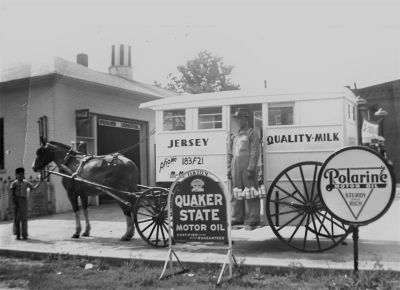 It's a photo of my great-grandpa Irvin Granville Bolinger delivering milk with my grandpa (photo pictured on this page). The photo reminds me of a time when personal contact, trust and relationships were more meaningful. A time when business was conducted with a firm handshake and a smile. My great-grandpa's middle name was "Granville". I love the name so much I gave it to my youngest son, and my business. Now as an Independent Insurance Agency I channel my inner "Monica" partnering with families and small businesses every day. It's my mission to educate clients on the vast amount of coverage options and choices that will meet their objectives with a goal of aligning to their exact insurance needs. As an Independent Insurance Agency, Granville Insurance represents many companies providing the best home, auto, and business insurance. We dedicate ourselves to helping our clients find the best coverage and value for their individual needs; whether you are finding your coverage to be a little bland, or maybe just want to discuss The Avett Brothers. If it's the latter, I'm not sure where my insurance expertise will fit in, but I'm always up for a conversation. Just don't be surprised if it comes up. We want you to have a positive overall experience with Granville Insurance. Our one on one service approach is our #1 goal for all our insurance clients. Give us a call at (260) 267-5810 or contact us through one of our quote forms, and we'll be happy to answer any of your insurance questions.